If you are cancelling please telephone us on 0114 229 3090 as soon as possible, and at least 30 minutes before your appointment time. This will enable us to offer your appointment to someone else. 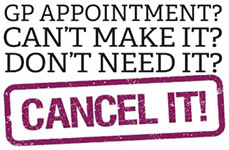 Alternatively you can cancel your appointment online using SystmOnline if you are signed up to the service.